Sadly, our Skype isn’t very good because we live out in the country and have slow internet. The ended up not using practically any of it. 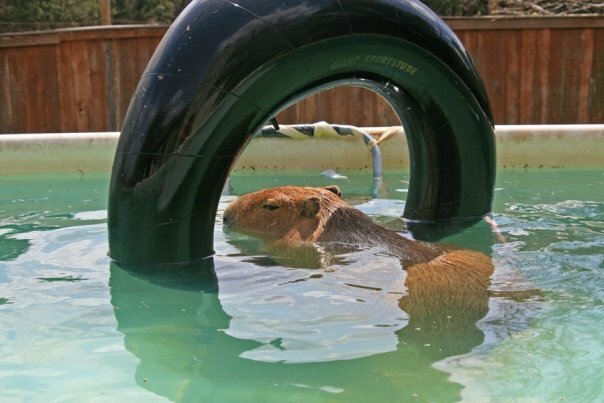 But they did use a bunch of video of me and of other capybaras in their show. I have no idea what they said, well just a little tiny bit of an idea. 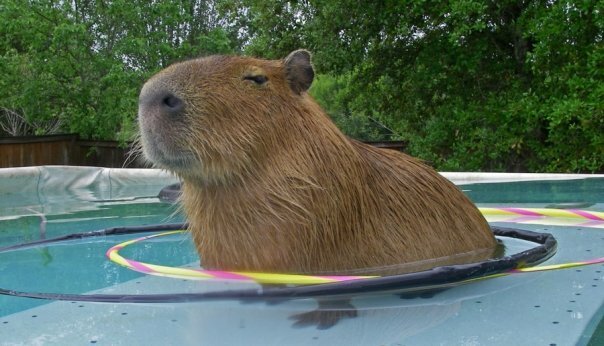 My owner says tabatae means eat and I know kapibara means capybara. I am hoping my wonderful Japanese translator, Chie, will give us a quick summary of what they are talking about. I hope they didn’t say anything mean! 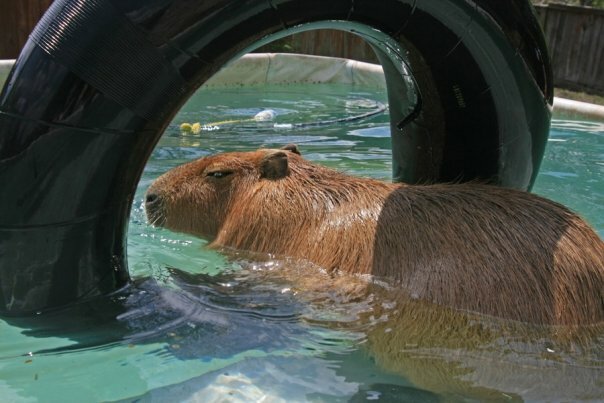 The capybara part of the video starts at 5:15. Doga-saito ni sekaiju kara takusan no doga ga toko sare, aisareteiru dobutsu ga imasu. 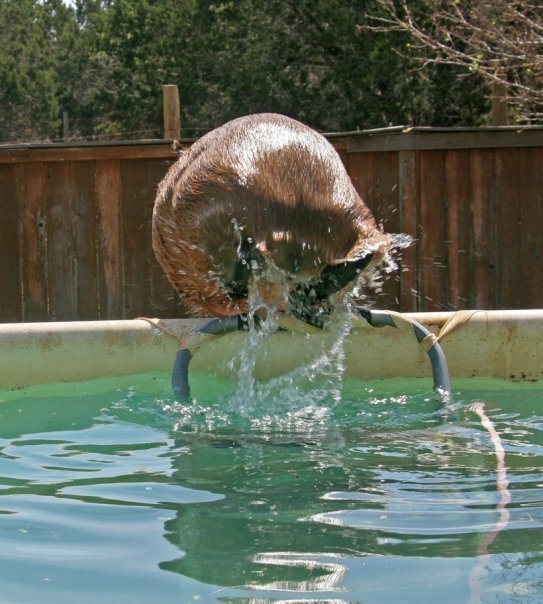 There is a globally beloved animal whose videos were submitted from all over the world. Kono kapibara no samazama na hyojo wo toraeta, nipponjin no doga ga wadai desu. 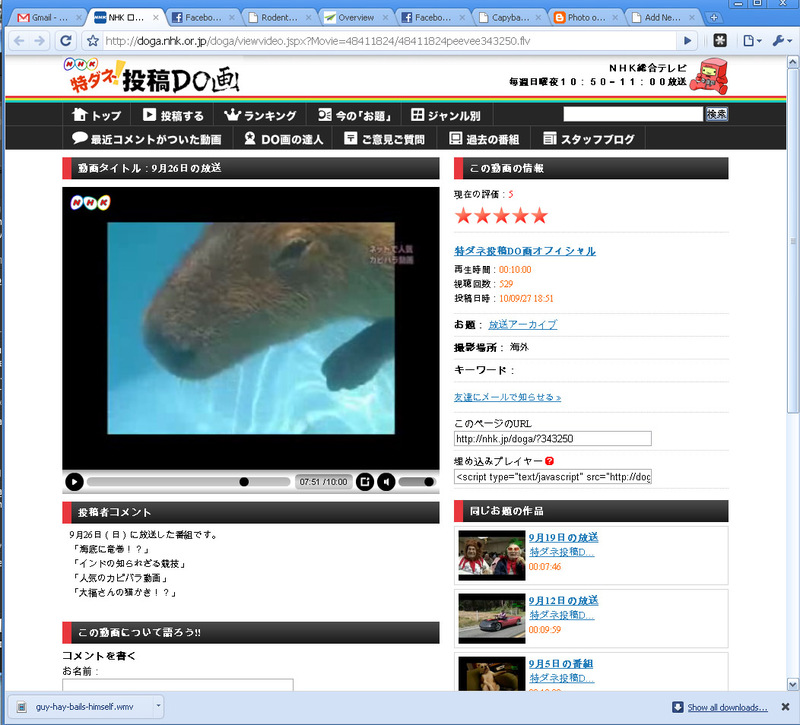 First is a video by a Japanese poster which captured the capybaras’ various activities. Sekai saidai no nezumi, kapibara wa otonasii seikaku to aikyo tappuri no hyojo ga ninkino himitsu. 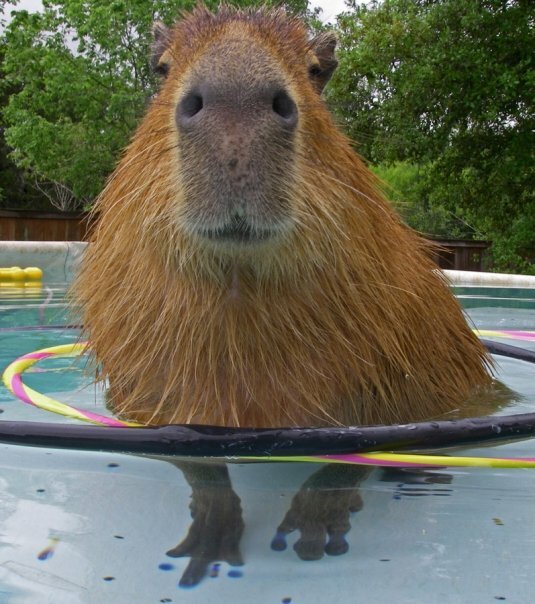 The world’s largest rodent, the capybara, gained its popularity from its mellow characteristics and affable activity. Soredemo tabete irut, mata okorarechaimashita. Still trying to eat, again, intimidated. Toku kara, urayamashiso ni nagamete imasu. Oshiri wo naderuto, kimochi yoku natte goron. when people rub its rear, it lazily lies down. Kocchi no kapibara mo goron. This guy also lies down. Tokosha no fuwafuwakapibara-san wa, nihonju no dobutsuen wo tazune, koremade ni 80-pon ijo no doga wo toko shiteimasu. Fuwafuwakapibara-san, the poster, has visited zoos all over Japan and posted over 80 videos so far. Satsuei no toki wa, isshun no hyojo wo nigasanai yo, kapibara no mae kara nanjikan mo hanarenai sodesu. 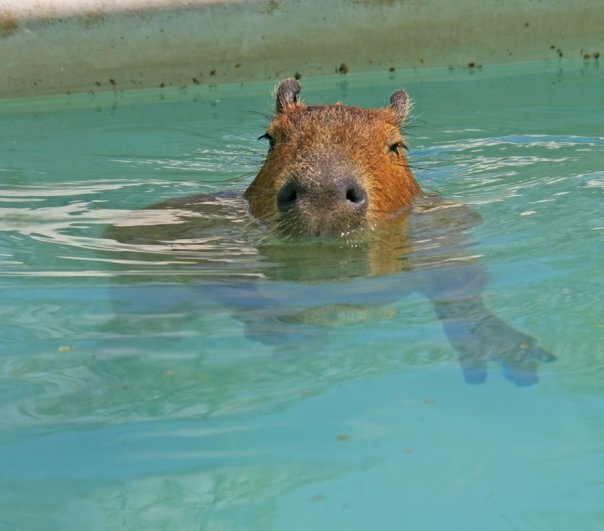 When he shoots, he doesn’t budge for hours in front of capybaras so that he doesn’t miss the very transient expressions shown by the capybaras. Ippo, amerika dewa, kapibara wo jitaku de katte, doga wo maisyu no yoni toko shiteiru hito ga imasu. 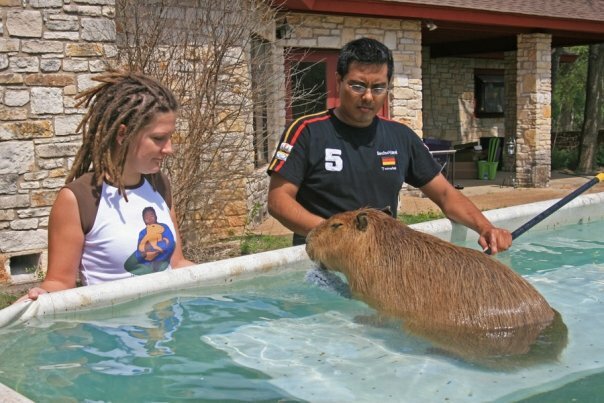 On the other hand, there is a person who keeps a capybara at home and keeps posting videos almost every week in the US. Merani Tiperudo-san to Kapurin-kun, 3-sai desu. Ms. Melanie Typaldos and three-year-old Caplin. Doga saito ni hajimete tojo shitano wa seigo 6 syukan no toki desita. When he debuted on a video site, he was six weeks old. Sore irai, sukusuku to seicho shiteiku yosu wo zutto kiroku shite kimashita. She has continued recording his healthy growth since then. Dobutsuen dewa misenai sugata wo mirukotogadekiru to wadai ni natte imasu. 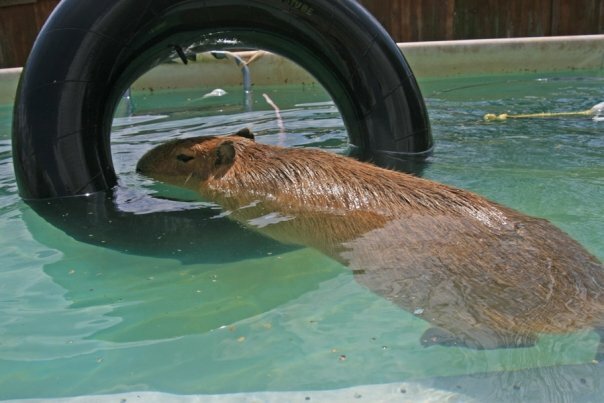 His reports gained a reputation as we can observe his unique activities, different from capybaras in zoos. “We wish you all the best and a speedy recovery!! Tokosya no Merani-san wa Kapurin-kun wo tsujite, sekai no hitotachi to tsunagatte irunoga ureshii sodesu. Melanie is very pleased that she is connected with people all over the world through Caplin. Merani-san wa itsumo Kapurin-kun to issho, Toko wa korekaramo, zutto tsuzukiso desune. As Melanie is always together with Caplin, her posting will continue.